I've only had my Kindle a few weeks but I love it. I still haven't learned about all the features. I like that I can read NetGalley ARCs on it (so much nicer than reading them on a computer) and that I can instantly have a book in my hands instead of waiting a few days for it to arrive. I also like that I can read thick books like Outlander without any pain and I don't even have to hold the Kindle to read-I can set it on the arm of my chair. I do wish that there was a better selection of cases. At the moment I use it without a case, which I like when I am at home, but if I were to take the Kindle on vacation or elsewhere I would like a case for it. I just haven't found one that I like. My other complaint is that sometimes there seem to be more typos in Kindle e-books than the corresponding print version. Overall though I am so glad I finally got a Kindle. I still prefer print books but this is a nice alternative, especially when my book shelves are getting so full! I have a Nook and LOVE it. I too find that I read faster on my Nook - wonder why that is??? I also love that I can get books off Netgalley and Simon Galley Grab. I need to use the highlighting more because I think that would be good for remembering what I want to say with reviews. Great thoughts. I didn't know about the "clipping" file filling up -- I need to look into that on mine. I'm not sure about the clipping file filling up either, I've never had that issue, but maybe you take WAY more than me? Thanks for doing a posting on this. I have gone back and forth trying to decide if I really want a ereader but I think I'm leaning towards a Nook since you can check out public library books on them (can't do that with a Kindle) and they have the best reviews (that I have read). Also, I think it is very interesting how you and someone else posted that you seem to read books faster. Wonder why that is? I've had mine for 8 months alrady and I have to say that it was love at first sight also. It's true I think you read a lot faster with the Kindle, don't now why though... But is great! A thing that I love is that I can buy my book from the kindle itself and in less than 30 second is there for me to read it. I've bored my mums a few times and Im not a fan personally - but I can see how useful they are for some people - particularly if you have to carry around lots of books for classes or whatever. 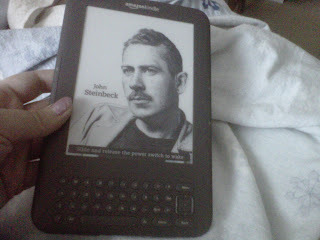 I'm loving my Kindle, too. The only thing that really bothers me is that the mobi format is proprietary (this is something that bothers me about Apple products as well). 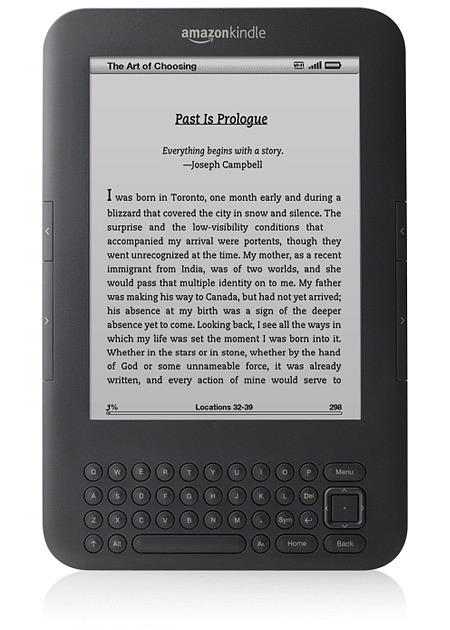 I recently bought a Kobo so I could read stuff only available in PDF and ePub formats. Overall, I like the Kindle better, but wish it could handle all formats. Allison: You can check out library books with your Kindle! Talk with your library or do some research, because I know it's possible, I just haven't done it yet. And even if you can't check out library books, you CAN use booklending.com, which is amazing. I, too, find that I read a lot faster on the Kindle than in a book. I don't know why that is, but it's true every time. I have several friends who say the same. And if I'm reading on my couch in the afternoon, I tend to get really sleepy, but not with the Kindle. I can read for much longer periods of time without feeling the need for a nap. Weird! I love my Kindle. My screen cracked last weekend. Not sure why, but it did. I called customer service on Tuesday and I had a new Kindle by Thursday. They were easy to deal with and all I need to do is send in my old Kindle. Definitely liked that aspect. I also have and love my Kindle. I'd better check the clipping file to make sure mine isn't also filling up. So far I have only 20 books. But I'm eyeing several more. I have to be careful, because the immediacy of the downloads have caused me to buy more than I need to!